Georges Cuvier is regarded as the father of paleontology. He convinced a skeptical scientific world of the reality of species extinction. He used comparative anatomy, a science he pioneered, to reconstruct extinct animals – for example, he established from drawings that a fossil he named pterodactyl was a flying reptile. He promoted the theory of catastrophism – that Earth’s geology and natural history have been shaped by periods of stability interrupted by violent events during which old species die out and are replaced by new species. He ruled out evolution as a mechanism for producing new species, believing they followed naturally after catastrophes. Georges Léopold Nicolas Frédéric Cuvier was born on August 23, 1769 in the town of Montbéliard in the Kingdom of Würtemberg. The town is now in France, close to the Swiss border. His mother was Anne Clémence Chatel. His father was Jean George Cuvier, a retired lieutenant in the Swiss Army. Both parents were members of the Lutheran Church. Georges was a physically weak child, often in poor health. His mother devoted a great deal of time to him, ensuring he prospered both physically and mentally; she taught him to read when he was four, provided him with books, and taught him to draw. At elementary school Georges learned Latin and, age 10, he started high school. He excelled in Latin, Greek, Geography, Mathematics, and History – his favorite subject. His parents hoped he would become a church minister. Georges spent so much time reading that his mother tried to divert him into other activities, but she was unsuccessful. At his uncle’s house one day, Georges started reading Georges-Louis Buffon’s Natural History. Inspired by the book, he transferred his academic allegiance from History to Natural History, a subject suited to his keen mind and excellent skills as an artist. When Georges was 14, he was summoned by Duke Charles, the King’s uncle. The Duke questioned the boy and viewed his drawings. He told Georges he would pay for him to be educated at the Caroline Academy, a highly reputed university in the German city of Stuttgart. Georges spoke no German when he arrived in Stuttgart, but within a year, age 15, he had won the academy’s prize for German. The fact he had a photographic memory helped! Georges studied for a degree in administration, which in practice meant he studied a bit of everything. His fascination with natural history remained strong, and he devoured books by its most eminent practitioners, including Carolus Linnaeus. He also collected plants and constantly made drawings of birds, plants, and insects. The Caroline Academy’s character and daily routines would appear bizarre to students at a modern university. The discipline imposed on the academy’s students was military – they wore uniforms, obeyed commands, and faced frequent room and personal inspections. Any faults were penalized. The quality of education at the academy was excellent and places were highly sought after. After four years at the Caroline Academy, Georges Cuvier graduated as one of its top students. In July 1788, not quite 19 years old, Cuvier began work as a tutor in the town of Caen, in Normandy. Within two years, he had begun comparing the skeletons of contemporary living creatures with fossils. He realized he could deduce a lot about the structure of fossilized creatures by carefully noting similarities with the bones of contemporary animals. Word about Cuvier’s comparison studies reached Paris, and in 1795, Jean-Claude Mertrud, chair of comparative anatomy at the great botanical gardens of Jardin des Plantes, gave Cuvier a job as his assistant. Shortly after this Cuvier was elected to the French Academy of Sciences. In 1796, he began lecturing at the École Centrale du Pantheon. 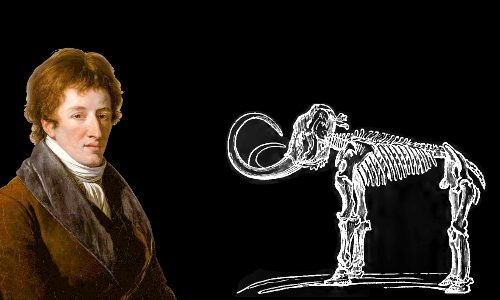 In April 1796, Cuvier read his first paper at the National Institute, demonstrating that mammoth bones are different to those of any modern elephants. He established that mammoths, Indian elephants, and African elephants are three distinct species. He then posed the question, where are the living mammoths? Cuvier’s drawing of a mammoth skeleton. He convinced his fellow scientists that since mammoths are too big to be hidden from modern eyes, they must be extinct. Although it might seem obvious to us today that extinction happens, in Cuvier’s day, people thought the opposite was obvious. They believed that since God had made all animals, all animals must be perfectly designed, so could never become extinct. He also identified and named a fourth distinct and extinct member of the elephant family – the mastodon. Later in 1796 he demonstrated that the bones of a ground-dwelling giant sloth also represented an extinct species, which he named Megatherium. Cuvier’s comparative anatomy and principle of the correlation of parts allowed him and others to reconstruct extinct species from limited evidence. For example, an animal with the teeth of a herbivore, such as a sheep, would have an appropriate digestive system, not the digestive system of a carnivore. Using his principle of the correlation of parts, in 1800 Cuvier was the first scientist to publish work identifying a fossil as a flying reptile. He named it pterodactyl. Cuvier’s observations of fossils led him to theorize that our planet has endured occasional sudden violent events and these have caused extinctions of species. He called these events revolutions. He was not the first to advance a theory of catastrophism, but he provided scientific evidence to back it up. The theory of catastrophism was at odds with father of geology James Hutton’s theory of uniformitarianism. Today we recognize that, while our planet’s surface has been molded for eons by the uniform processes we see operating every day, such as weathering and sedimentation, its history is peppered with catastrophic events, such as apocalyptic volcanic eruptions and meteorite impacts, that have powerfully affected the planet and its lifeforms. This was also Cuvier’s view – his studies of rock strata revealed that our planet enjoys long periods of relative stability interrupted by violent episodes. Cuvier urged his fellow paleontologists to ignore the Biblical Flood in their work, saying that too literal an interpretation of the Bible would lead their work astray. Cuvier’s rock strata research with Alexandre Brongniart supported the work of William Smith in establishing one of paleontology’s most important principles: faunal succession. 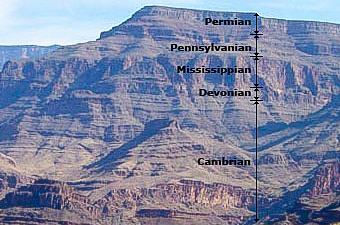 This principle states that the order in which fossils appear in rock layers is reliable and predictable. This means that animals in existence during different geological eras do not appear in the same layers of rock: the deeper the layer, the older the fossil. Rock strata on a grand scale. U.S. Geological Survey image of Grand Wash Cliffs in eastern Lake Mead National Recreation Area. Cuvier’s best known work is Le Règne Animal (The Animal Kingdom) first published in 1817. The book is a comprehensive summary of Cuvier’s studies of fossils and living species, and contains over 300 of Cuvier’s own drawings. 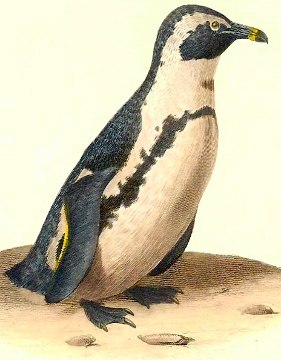 A beautiful drawing of an African penguin by Cuvier. In 1812, Cuvier told the world it was unlikely any large fossil animal remained undiscovered. He was wrong. Many large animals have been discovered since then, including, for example Argentinosaurus, discovered in 1987. Interestingly, although no good complete specimens of Argentinosaurus have been found, Cuvier’s principle of the correlation of parts allows modern paleontologists to estimate this dinosaur’s weight to be as much as 100 metric tons. Two colossal dinosaurs and a human. On the left is Brachiosaurus, discovered in 1903. In the middle is Argentinosaurus, discovered in 1987. In Cuvier’s time, the Darwin and Wallace theory of evolution by natural selection lay decades in the future. Theories of evolution, however, had been advanced by Jean-Baptiste de Lamarck and others. Cuvier argued that species did not evolve; they came into existence or became extinct during catastrophic events. He saw no possibility that the creatures he had discovered as fossils could have been the origin of modern animals. He believed species were fixed, citing the fact that mummified animals from Ancient Egypt known to be thousands of years old were the same as modern animals. Cuvier’s opposition to evolution was later blamed in France for the fact that British scientists got to the theory of evolution by natural selection before French scientists. 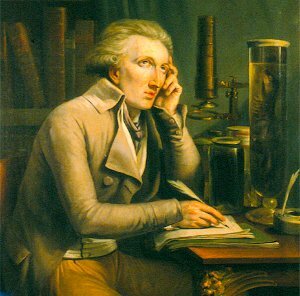 For some time Cuvier was portrayed as not truly a French scientist – after all, he had been educated in Germany, which, according to stereotypes, meant he was merely a collector of facts, rigid, and authoritarian, rather than a scientist. Cuvier believed that human survivors of a catastrophe had lived in isolation, leading to the existence of three human races: Caucasian, Mongolian, and Ethiopian. He expressed the view that the Caucasian (his own, of course!) was the superior one. Although he opposed the idea of evolution, Cuvier’s linkage of isolation of human races to differences among them strongly echoes Darwin’s later discovery that isolation of animals on the Galapagos Islands had resulted in evolutionary changes. decide which scientific research work should receive financial support. Other scientists resented Cuvier’s power and characterized him as arrogant and egotistical. In 1819, Cuvier was made a member of France’s nobility, becoming Baron Cuvier. Cuvier is one of 72 French engineers, mathematicians, and scientists honored with engraved names on the Eiffel Tower in Paris. Others include, for example, Antoine Lavoisier, who revolutionized the science of chemistry, and André-Marie Ampère, the founder of electromagnetic theory. In 1803, age 33, Cuvier married Madame Duvaucel, née Anne Marie Sophie Loquet. She was the same age as Cuvier, and a widow with a son and daughter. Madame Duvaucel’s former husband was one of thousands guillotined during the French Revolution’s Reign of Terror. Cuvier and his wife had four children, three of whom died in childhood. Cuvier saw no reason to prevent women working as scientists, and encouraged his highly intelligent surviving daughter Clémentine to follow in his footsteps and begin work as his research assistant. Sadly, tragedy seems to have stalked Cuvier’s children, and Clémentine died of tuberculosis in 1827, age 22, shortly before her planned wedding date. Cuvier was absolutely heartbroken. His stepchildren also followed in his footsteps. Alfred Duvaucel became an eminent naturalist. Sophie Duvaucel, who was renowned for her academic brilliance, became Cuvier’s reliable friend, scientific co-worker, and secretary in his later years. Georges Cuvier died, age 62, of cholera on May 13, 1832 in Paris, and was buried in the Cemetery of the Father. "Georges Cuvier." Famous Scientists. famousscientists.org. 29 Jan. 2017. Web. Image of Brachiosaurus/Argentinosaurus/Human licensed under the Creative Commons Attribution-Share Alike 2.5 Generic license by Martin Sander, et al, Steinmann Institute, University of Bonn.